OLD BUDS GABBING AWAY: Patriots quarterback Tom Brady chats with one of his former teammates, Texans defensive coordinator Mike Vrabel, after a joint practice yesterday in White Sulphur Springs, W. Va.
WHITE SULPHUR SPRINGS, W. Va. — Long after the final joint practice session between the Patriots and Texans wrapped up at the Greenbrier Resort yesterday, two old friends got together for a little chat before leaving the field. 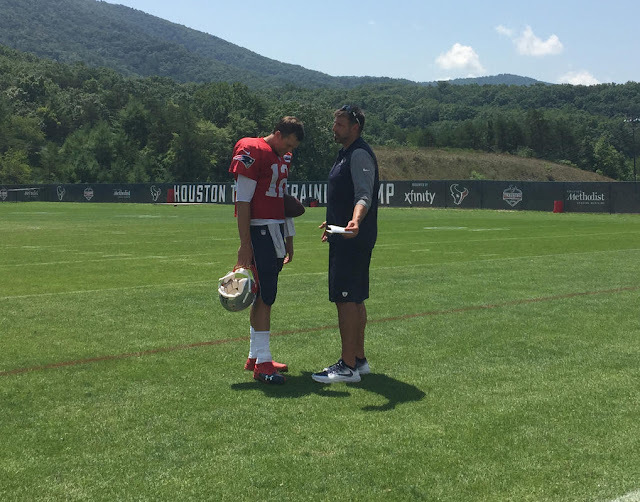 Tom Brady and Mike Vrabel were in deep conversation. They huddled for about 10 minutes at the divider between the two fields. What were the former Patriots teammates talking about? Perhaps they were reminiscing about their awesome past, with three Super Bowl rings won together at the start of the Patriots dynasty. Or maybe Vrabel was complaining to Brady about all the weapons he now has to try and stop on the Patriots offense as the newly appointed Texans defensive coordinator. Or maybe Brady was trying to get Vrabel to ease up on sending Jadeveon Clowney, Whitney Mercilus and a now healthy J.J. Watt after him when the teams meet Week 3 during the regular season. Whatever the context, it’s been quite amusing, albeit odd, watching Vrabel direct the Texans defense on the opposite side from Brady during these practice sessions. There’s been plenty of animated banter between the two, which is probably how it was during their practices as Patriots. Only now, Vrabel is preparing his defense to try and beat his good friend and former team. Well, Vrabel isn’t giving the Texans their just due. They played pretty well in the first half of the AFC divisional round matchup, beating Brady up with a relentless pass rush before Dion Lewis stole the show in a 34-16 Pats win. And during these joint practices, the Houston defense also gave Brady some fits, but it’s still not like the stress of a real game. We’ll know more about how well Vrabel has prepared this defense next month when the games count. Asked if he was trying to put his own stamp on the defense, Vrabel tossed that notion aside. Speaking of that, right before the start of every practice, Vrabel can be seen with a group of coaches, and players joining in on occasion, playing the familiar schoolyard game four-square or box ball. Watching him the past two days, he’s easily the most competitive participant. Most people in the football world who know Vrabel will tell you he is destined to be a head coach one day. Bill Belichick is a believer, and so is Brady.